Once again I have caught some sinus bug and a sore throat. Luckily I have a solution other than making my grandmother's beef veggie soup (even though I'm making it anyway) to cure it. 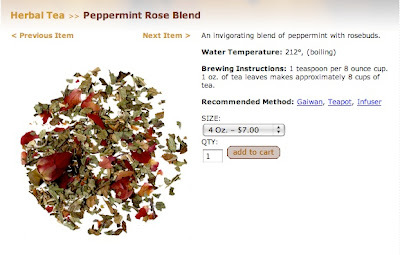 It's Peppermint Rose loose leaf tea from the Red Blossom Tea Company. I found this herbal tea two years back when visiting the Te Cafe with my sister. After having way too much coffee, I was looking for a low caffeine tea and happened upon it. Amazingly the mint in the tea completely removes the pain of a sore throat for a couple hours. Plus you can't beat seeing tiny rose buds as you scoop the tea into your infuser. As loose leaf tea goes, I found it was cheaper to buy the tea from Red Blossom when compared to the Te Cafe. And you may think that 4 oz isn't large but in the world of light weight tea leaves, it's a good size bag!